Um, hello. How amazing is this? 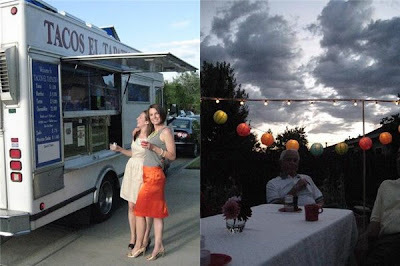 Bunny + Chip had a taco truck drive right up to the house to cater their engagement party. There's no reason this couldn't be a wedding reception. Just saying. i love this... nothing better than a taco to celebrate your big day with? really nothing better than tacos to celebrate any day! if our favorite UK kebab van hadn't been AWOL for the summer (bon voyage, achmed! ), it's entirely possible that we'd have had him pull up and serve us all chips and cheese. with salt and vinegar and chili sauce and garlic mayo...god, i love food. 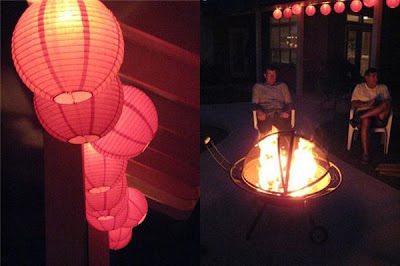 Seriously awesome my boy would love it. Maybe we can get the burrito wagon to come on over and say hi!! the only thing that could make this any cooler is a mariachi band. Actually, my dream would be convincing a taco truck to stay put outside my apartment 24/7 for my taco cravings. But this is a close second. carly, I'm so glad you don't mind that I scooped your photos... there I was blog surfing at 1am last night and they were just too cool to resist! Why wasn't I this cool when I got married?! WTF I want a do-over. so stellar! who doesn't love tacos??! As a gal who just married a lovely Mexican man in Mexico City I LOVE this idea! Bravo. ha! we're having a taco cart for our boy/girl shower. 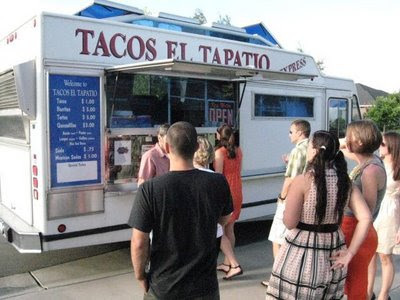 i think, if you live in l.a., a taco truck/cart must be somehow integrated into your wedding festivities.